Meet a Few of the Key Characters of TORUK-The First Flight! The creation process is currently underway for the new Cirque du Soleil touring show, TORUK – The First Flight, inspired by James Cameron’s record-breaking movie AVATAR, which will begin touring in November 2015. TORUK – The First Flight takes place thousands of years before the movie AVATAR and before any humans visited Pandora. Lead by an actual Storyteller character, the show will follow three young adults – Ralu, Entu, and Tsyal – and the first flight of the Toruk. Ralu, Member of the Omaticaya Clan, is the son of a formidable hunter who taught him exceptional focus and discipline. Ralu is a sensitive and compassionate boy on the brink of adulthood. Although he is only 14 years old (in Earth years), there is a calm and quiet force about him that underscores his carefree attitude. Always on the lookout for his childhood friend and protégé Entu, Ralu is a natural born leader. Whenever the going gets tough, he channels all his energy and skills into the challenge at hand and invariably gets the job done. Just ask Entu, whom Ralu once saved from certain death by luring away a thanator during archery practice deep in the rainforest. No wonder everybody rallies behind Ralu – his is a doer and a thinker with a heart of gold! Entu, Member of the Omaticaya Clan, lost both of his parents early in life in a freak attack by a thanator. He is the same age (14 years old in Earth years) as his lifelong friend Ralu – his mentor – with whom he has always engaged in a healthy competition that has definitely kept him on his toes. Spunky and intense, Entu is fully in touch with his emotions and knows to follow and trust his instincts. One day, when a member of his clan ventured too far out on a cliff edge and was left dangling on a limb, Entu instantly concocted an ingenious counterweight device using his pack, a sturdy branch and some vines to lower himself down the mountain face and save the boy, showing total disregard for his own safety. With his quick wit and dauntless spirit, Entu is eager – and ready – to dive headlong into the adventures that lie ahead. Tsyal, Member of the Tawkami Clan, is the only child of a village chief who lost her mother at a tender age. 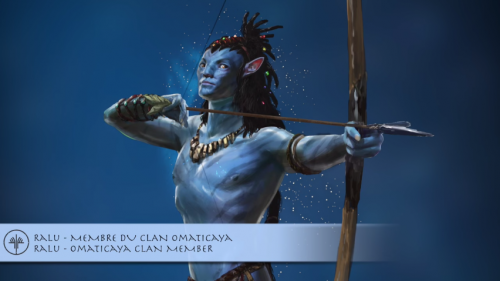 She was raised by her grandmother with the help of other members of her clan, as is the custom among the Na’vi. Highly proficient in herbal lore, her grandmother was a chemist widely revered among the Tawkami for her unique remedies and concoctions. Tsyal’s clan is renowned throughout the land for their knowledge of chemistry and alchemy, and the abilities she inherited from her grandmother are transmitted every two generations through a special bond among clan members. Spurred by her grandmother’s legacy and wanting to live up to the expectations bestowed upon her, Tsyal has taken great pride in creating innovative mixtures and recipes of her own. True to her clan nestled deep inside the primeval forests of Pandora, this easygoing, sprightly girl with an indomitable spirit has a cheerful nature and loves to play tricks. With a mere seed, she can put the fiercest beast to sleep; with the frailest-looking flower, she can induce the most beautiful dreams or provoke the most terrifying nightmares. Such is the tremendous power of the natural elements that Tsyal and her clan have learned to understand and harness. 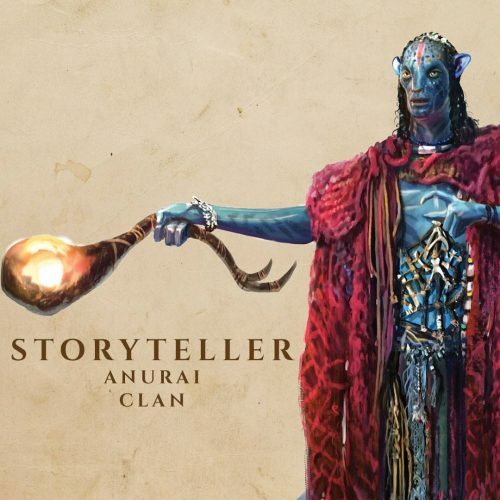 The Storyteller, an Anurai, is one of the last surviving members of this clan. He has been around humans – aka the Sky People – ever since he met a feisty xenobotanist with whom he forged a powerful friendship back in the 2140s. Several years later, the Storyteller witnessed firsthand the last time of Great Sorrow during which the Omaticaya Hometee was destroyed. Distressed by the discord among the clans on his home world, and learning how humans were tearing each other apart in the wake of the great climatic upheavals on Earth, the resilient Storyteller decided to reach out once more to the Sky People who saw him as a kind of translator and a wise go-between. 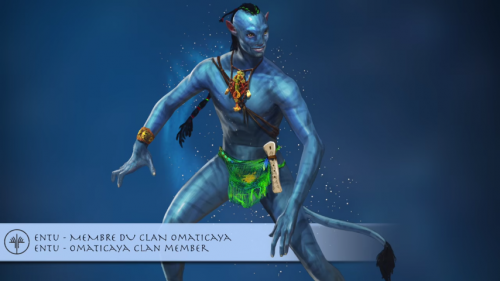 By making humans aware of the bravery, valor and ingenuity of the Na’vi, he seeks above all to avoid history from repeating itself. He also aims to impress upon the Sky People the urgency of preserving their bonds with nature, and the necessity of pulling together to live in unity and peace. “During the creation of TORUK – The First Flight by Cirque du Soleil, artists work in pairs to create the characters of Ralu, Entu and Tsyal. Watch while these duos explain how two heads are better than one as their characters come to life during rehearsals. When two artists share a character, they get to watch their “second self” at work, feed off each other, and stretch their own limits. It’s an opportunity to see both the forest AND the trees.